Presently our dog yard has 17 people friendly Alaskan Huskies who are anxious to meet you and introduce you to the sport of Dog Sledding. 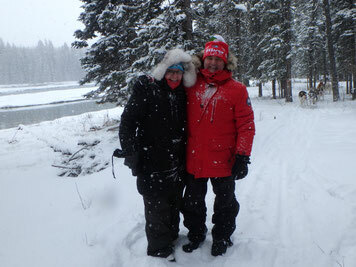 We offer a "learn-to-mush" program, in a half day (approx. 3 hrs), for 2 people. There is only one group here at a time so you have undivided attention to meet your groups needs. The progressions are completely at your own pace according to your comfort level. After introductions, a safety talk and a demonstration of the sled and gear, we move out to the dog yard to meet the dogs. 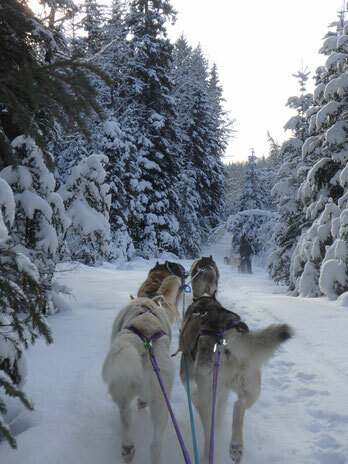 Clients are welcome to participate in all aspects of the pre-sled experience from taking dogs from their yard to the tie-out chains by each sled, harnessing dogs and hooking the dogs up to the sled. 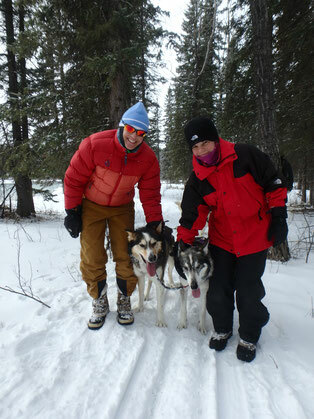 Each person sleds with a guide on all our trails with up to 8 dogs. Leaving the dog yard you ride in the sled with the guide driving and then move to driving the sled, with the guide in the basket, when you feel comfortable to do so. Switching places often occurs for the tricky sections along the way. Because you are travelling with a guide, there is plenty of opportunity to ask questions and learn as you go. Of course, if you prefer to go for a ride throughout, relax and take in the scenery that is always an option. It is your experience to enjoy however you wish. A Full Day or Half Day of fun and adventure is our hope for your experience. We look forward to sharing our passion with you, as well as our friendly, energetic dogs, who live to run. Risk Management: Comprehensive orientation, skill instruction by certified guides and on-going safety monitoring. A waiver must be signed by all participants prior to participation. Program options subject to change re: Weather, physical capabilities and client satisfaction. Terms: A 50% deposit is required to book an experience, the balance being due in full 2 weeks in prior and 4 weeks prior Christmas week. This is refundable if we cancel due to deemed unsafe conditions for running the sleds. VISA, MasterCard, cheque, cash or e-transfer are accepted.